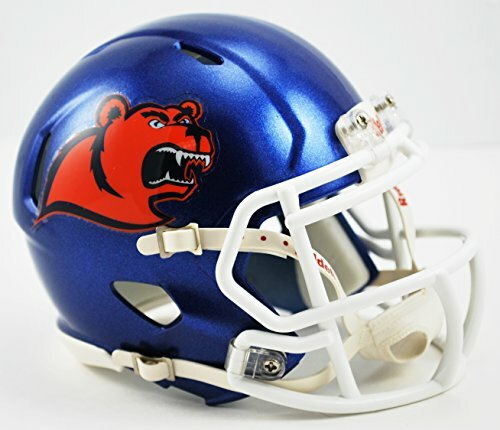 Coast Guard Bears Mini Speed College Football Helmet. The ultimate NCAA College mini speed football helmet collectible, perfect NCAA mini speed football helmets for autographs and collectors. Mini Speed Football Helmet with great graphics. Official NCAA Mini Speed Football Helmet with official NCAA team decal. ABS plastic Mini Speed Football Helmet shells with plastic facemask. Realistic interior foam padding, vinyl-leather chin strap. This is an affordable NCAA football helmet for the true fan. Size: 1/2 scale versions of NCAA football helmets. Size: 6"(L), 4½"(W), 5"(H) - (NOT FOR WEARING).